This was a strange one. 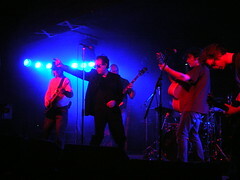 The Blue Aeroplanes reform on the back of the re-issue their best album, Swagger, and set out on tour. Except I’m not sure if they ever split up as they seem to have released an album every few years since the last one I remember, Rough Music, back in 1995. I was a fan of theirs dating back to 1989 when I saw them a couple of times opening for REM. The next three years saw the Aeroplanes at their peak, releasing Swagger and Beat Songs to great critical acclaim before gradually dropping off the radar after the patchy Life Model in 1994, which is where I jumped off. Hopes of a full-on reunion of the classic early-90’s line-up were dashed when the band took the stage and I only recognised lead singer/poet Gerard Langley and his brother John, on drums. Well, I recognised most of the other members because two of them, along with John Langley, were in the first support band Saturation Point who we caught the end of and who sounded terrible: loud, squally instrumentals with flashes of Zeppelin and Hendrix guitar licks and no discernable tunes. Another member was Gerard Starkie who was once in a band called Witness who released an excellent album called Before The Calm in 1999 and a not so excellent one called Under A Sun in 2001 before disappearing from the face of the planet. Gerard played a short acoustic set after Saturation Point and it was fairly dull, typical acoustic singer/songwriter fare. There were no members on stage from the third and final support band Catlow, who are from Canada and played some rather catchy, straight forward indie rock. So, The Blue Aeroplanes took to the stage to almost no applause from a disappointingly small crowd who had nudged forward almost to the point of reaching the stage, but held back at the last minute and left a semi-circular void in front of the band where one might imagine a mosh pit would normally be. The first few songs I didn’t recognise; some were from new album Altitude and they sounded ok, although the muddy vocal mix rendered Langley’s words almost inaudible, which was a shame as his lyrics and the half-sung/half-spoken delivery of them are such an intergral part of the Aeroplanes make-up. They used to have a Polish dancer (no, not a pole dancer) called Wojtek who was, if I recall, classically trained in ballet and was a delight to watch. In his absence Gerard Langley took over dancing duties and it was ugly. I would roll out the old cliché about your dad dancing at a wedding but that would be a major slight on your dad’s dancing abilities. Langley’s dancing was both impossible to watch and impossible to take your eyes off, like watching an episode of The Office or a slow motion replay of some footballer breaking his leg on Match Of The Day. The other integral part of The Blue Aeroplanes’ sound was the guitars: they always had at least three great guitarists in the band and tonight was no exception. The guy from Saturation Point was particularly good and when the band got round to playing a few classics off Swagger such as “Jacket Hangs” and “Weightless”, the guitars were crystelline perfection , sounding even better than I remember back in the day. The indie dance classic “…And Stones” was exceptional with Langley toning down the bad dancing to concentrate on his vocal performance while the band built a wall of guitar in front of him. I recognised few other songs; my own fault as I should have boned up on the excellent earlier albums Tolerance and Spitting Out Miracles. I did recognise the folky “Days Of 49” from the latter, which was sung by Gerard Starkie and sounded very close to the original. They encored, as always, with their rock-out cover of Tom Verlaine’s “Breaking In My Heart” which brought back memories for me and some of the crowd, which apart from a few die-hards, had been strangely subdued all night. It was good to see the band again but I’m not sure, given the indifference of the small crowd, whether this reunion or comeback or whatever is going to last too long. This entry was posted	on Saturday, April 22nd, 2006 at 12:08 am by The Ledge	and is filed under Gig Reviews, Reviews. You can follow any responses to this entry through the RSS 2.0 feed. You can leave a response, or trackback from your own site. Interesting review and a shame the crowd was not bigger and more appreciative. To answer the concern at the end, I saw this band performing on Saturday 4th December 2009 in Bristol where a large home crowd was packed into the small venue. The only more crowded area was the stage which struggled to accommodate 10 or so musicians plus Wojtek – yes he was there too! The setlist was similar to the one described above plus a new song from their forthcoming album “When Things Are Good” which is due to be released in early 2010. A full UK tour and a trip to a music festival in Texas are also planned. A person necessarily assist to make seriously articles I would state. This is the very first time I frequented your website page and thus far? I surprised with the analysis you made to make this particular post extraordinary. Great task! Hey, basically started to be aware of your own weblog as a result of Yahoo, and discovered it’s mostly truly educational. I will be thorough for the city. I’ll be thankful just in case you carry on the following from now on. Lots of people may be gained from the crafting. Cheers! I see that you are using WordPress on your blog, wordpress is the best. *:~-?